After speaking to our Operating Director Ivan Bjelajac, next in our series of GoDaddy leader interviews is Ryan Murphy. He has been at GoDaddy since 2010, and is currently leading a design team of 8 people that work on 13 different products. 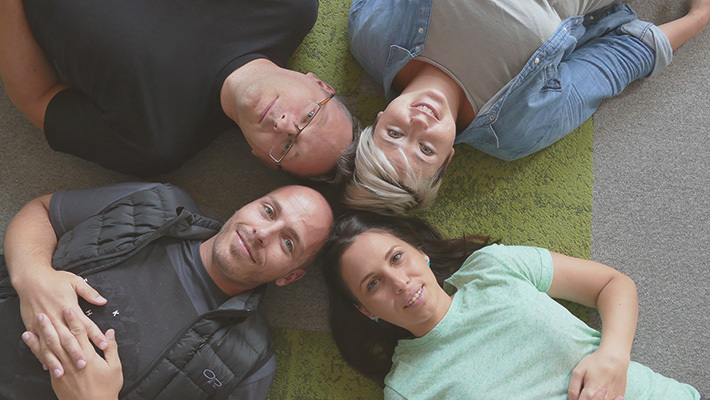 His team is distributed across four GoDaddy locations and two continents. In this interview we talk to Ryan about his leadership style, how he handles difficult situations, and some of the projects and successes his team has had. Ryan believes that being a good leader means primarily being honest with your team. To him transparency is a core characteristic of a great leader, as well as, standing up for your team and investing in their learning and career goals. Ryan, can you name a person that had a tremendous impact on you as a leader? I can’t say that there was one person that shaped me, but it was a combination of all of my previous managers, colleagues and peers. I never had a traditional mentor, rather I would leverage people I had in my life. I would evaluate how they made me feel in certain situations and use that to help me be a better manager. How do you grow as a leader? Overall, I find it important to keep improving as a leader and to realize where your weak points are, so that you can improve on them. I grow the most from feedback from my team. I create Quarterly Manager Google Surveys that are anonymous and send them out. I really encourage my team to be honest with me and tell me how I can be a better leader. I also watch design leadership videos, like UX Week Conference and High Resolution Design. Another great learning platform is the Google’s ReWork project that looks at the data supporting the best hiring practices, diversity, operating structure, and fairness. What are the core values you look for in your team members? Curiosity. I like to work with people who always ask “why”. My team is made up of people who are not afraid to dig in and find out what the core problems are. I also value people who are connected to their work, who want to see it done well. Of course, I look for a certain skill level, and for their ability to work well as a team. I am a big team player so I like to hire people who are too. How do you cope in situations when a team member lets you down? Overall, I try not to be overbearing as a leader, and I like having a familiar relationship with my team. That means if someone lets me down the first thing I do is let them know how let down I feel. I believe in connecting on an emotional level with my team, and having honest conversations. I try to avoid having disappointments by having weekly one on one conversations and tackling problems on time. When folks on the team are exceptional, I try and celebrate and publicize it. I’m hoping to build a culture where people who do good things feel appreciated and compensated. It also gives junior or underperforming team members a clearer target to hit. What’s your decision making style? I make confident decisions with data. I try to always have measurables when making decisions, but that’s not always possible. When that’s not the case, I lean towards action. Try something and learn from it. As a Senior UX manager, what are some of the toughest decisions you have had to make? I feel very grateful for my team, because they don’t put me in tough spots often. However, I don’t enjoy giving poor performance reviews, and having those conversations. The key to those is to make sure the person knows why they are getting a bad review, and to know it early. Other difficult situations I have been in is resolving conflicts between a team member and member of another GoDaddy team. These are difficult, because every story has two sides, and I tend to protect my own. Being patient is important here. What are you particularly proud of that you and your team worked on in GoDaddy? We work on a few product lines, so it’s hard to pick one. I am proud of something we introduced in GoDaddy, which has helped with team alignment within our company. Based on the book “The Design Sprint” , we introduced this method to GoDaddy. This meant that teams were made up of marketers, designers, engineers and project managers. That way people from different teams come together to work on a product feature, and it meant that we got better communication between teams, better understanding for what each team does, and we created something of higher quality. In just two days we successfully aligned teams, and the output of the design sprint was validated by our customers. I am also tremendously proud of my team for creating GoDaddy Pro. That was a project that we worked on for a long period of time. With this project we broke a lot of ground at getting closer to our customers. 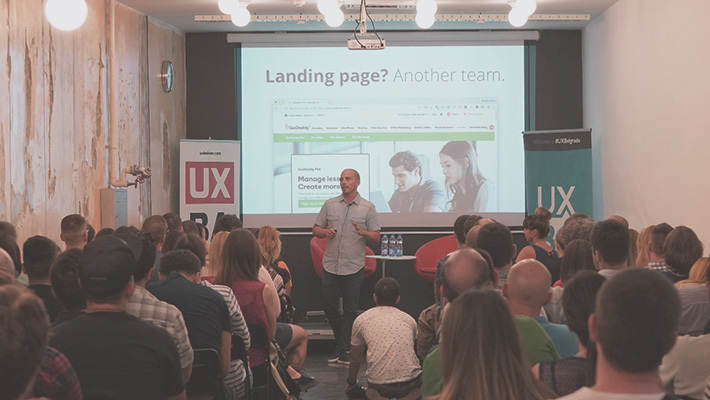 Now that you have designers in the GoDaddy Belgrade office, is that the first time you have a remote design team, and how do you handle leading a remote team? It’s not my first time with a remote team, but it’s the furthest remote team I have led. They are in a different time zone. To lead a remote team you need to learn how to let go. You need to trust your team and their abilities and hand over certain tasks or projects. I strongly believe that success comes only with ownership. I also try and meet my team whenever I can, so they have been over to Arizona and I have been to Belgrade. You partake in a lot of meetups either by organizing or speaking at them. How important do you think they are for personal development? Meetups are a great place to push yourself. It’s a place where you can meet new people, learn new things and get inspired. Granted you won’t go home with a whole new project planned, or with a new skill, but you will know how to proceed or where to look for the right information. Meetups help you to try reach new things you haven’t reached yet. Are you big on social media? How important do you think it is in terms of personal branding? I am not very active on social media, I feel like I never have anything smart to say. I do think that having a strong personal brand can help designers get better jobs. It can impress an employer, but I would still be looking for the core values in every hire regardless of their online presence. Easier noticeability and searchability are quite stressful to keep up to date. Being public with your opinions can challenge you and force you to think deeply about design issues. I’m all for that. How do you balance your work and family life? Do you find that sometimes you learn valuable lessons from your family that you can apply to work? I don’t feel that I have quite mastered this yet. I often have to work late or take long work trips, which means I am not spending as much time with my family as I would like. There are days where I have less work, so I would go home early and spend as much quality time with my wife and kids as I can. I can definitely improve on things like checking the phone on weekends, there is no need for that. Have I learned something from my family? Yes, lots. I think they remind me everyday of the importance of empathy and solidarity. I feel that my family has helped me treat my team at GoDaddy as my “work family”. Actually, my “work family” has helped me too, they remind me that sometimes you have to give people some time, rather than expect results immediately. I feel like I am the lucky one, learning from both sides. If there was one GoDaddy Pro tool that you couldn’t live without, what would it be, and why? One- click access. The beauty of GoDaddy Pro is having quality features all in one place. It means going to that one dashboard and just getting on with all of your tasks. I love that my team was a part of creating that, and I see designers and developers using our tools everyday and saving themselves a ton of time. Have your tried GoDaddy Pro? If not sign up here and start managing sites.